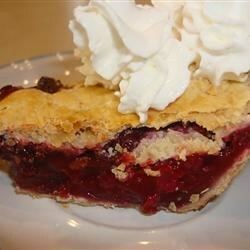 "Grandma's classic blackberry pie gets a new twist. Perfect for summer gatherings and parties. The kids will love it! Adjust the ratio of berries and chocolate chips to suit your preferences." Preheat oven to 425 degrees F (220 degrees C). Place one of the pie crusts into the bottom of a 9 inch pie plate. In a bowl, mix the sugar, flour, and cinnamon. Gently stir in the blackberries and chocolate chips. Sprinkle with lemon juice. Transfer to the pie crust in the pie plate. Place remaining pie crust over the top, and secure to the bottom crust by pressing with a fork, or fluting with your fingers. Bake 35 minutes in the preheated oven, until top is golden brown. Cool slightly before slicing. What an aweful way to ruin a blackberry pie. If your lust for chocolate is great than maybe this will be the pie for you. But if you love the simplicity of nature, leave the chocolate out. I only used one pie crust and 1/4c milk chocolate chips because that's what I had. It turned out very good. Very yummy! Would use less chocolate next time. It needs just a hint of chocolate, not a whole mouthful. But very good. Will be making this again!